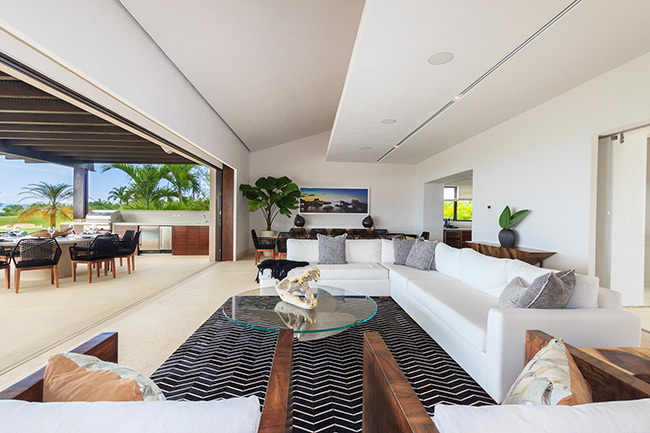 Villa Tres Amores features panoramic views over the Pacific Ocean. This luxury property is located in the tiny resort town of Punta Mita, Mexico. In addition, Villa Tres Amores is celebrating its one-year anniversary since opening its doors to luxury travelers. Located just steps from gorgeous white-sand beaches and championship golf courses that encompass the elegant resort town of Punta Mita. The resort fuses the five-star amenities of a world-class resort with the privacy of an intimate villa escape. As a result, the fabulous property offers a truly one of a kind, personalized travel experience. Villa Tres Amores is an idyllic escape from the bustle of everyday city life. Also, it’s a perfect place to stay in Mexico, especially as the cold winter weather moves in. The luxury villa is a truly spectacular luxury home. Thus it provides access to all of Punta Mita’s private beach clubs and restaurants within easy reach. Plus it is designed with objets d’art found around the world, resulting in a modern, global feel. There is no argument that Villa Tres Amores provides both panoramic views over the Pacific Ocean. The resort’s stunning design highlight a spectacular villa experience that is waiting for you. This luxurious property includes objects d’arts that were sourced from the property’s owners. The design pieces were discovered during their travels around the world. The end result reflects a modern, global aesthetic. Guests can stay in their choice of four en-suite bedrooms. Each one sleeps between 10 – 12 guests. Therefore, it makes the ideal setting for multi-generational family travel or couples traveling together. The spectacular views cannot be said enough. Peering out over the Pacific is an awesome and relaxing experience. The villa provides impeccable service. The staff is extremely professional and goes out of their way to please. What we like most about Villa Tres Amores is its sleek design. From top to bottom, it’s an extraordinary property in Mexico. As a result, it’s the ideal destination for honeymooners, family vacations, or golf getaways. In addition, it’s perfect for those who simply want to escape from the stress in our daily lives. The Life of Luxury can assist planning and booking your next luxury vacation. Choose your destination anywhere in the world and we’ll make it a special VIP experience. Consider staying at Villa Tres Amores in Mexico for a wonderful getaway. Return to follow our luxury blog. Stay abreast of the latest, luxury travel news.